Value investing and GDP growth look primed for a turnaround; out-of-favor value stocks stand to benefit. 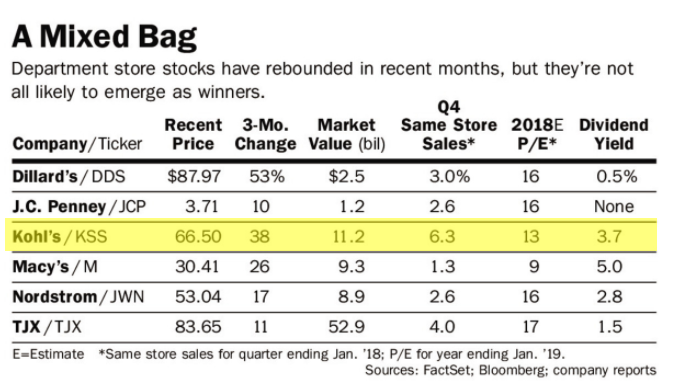 Department store operator Kohl’s is also showing signs of a turnaround; management’s willingness to try new initiatives appears to be bearing fruit. With almost 30% upside and a steady dividend, Kohl’s looks attractive ahead of earnings. 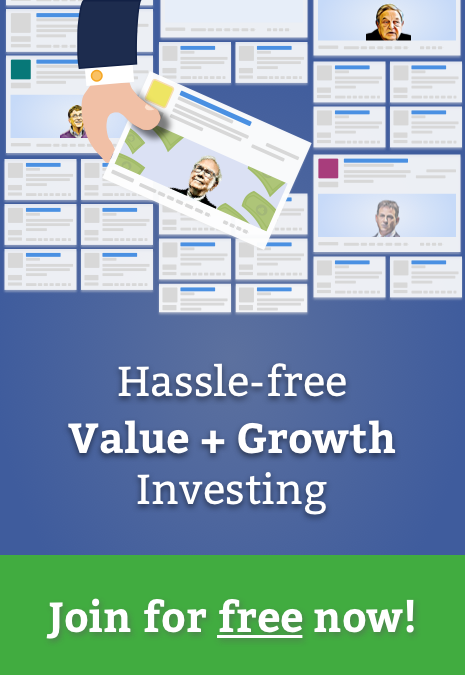 For over 25 years, from 1979 to 2006, value investing outperformed growth strategies by earning a total return of 1646% to 1248% respectively. Over the last 12 years, however, growth has outpaced value: the total returns for the Russell Growth and Value indices were 223% and 118% respectively. Gross Domestic Product also looks set for a turnaround. While GDP growth came in lower than the previous quarter it was the best first quarter since 2015. Consumer spending retreated, but low unemployment and increasing wages should help going forward. The first quarter may be affected by seasonal data quirks as well, potentially setting up a turnaround next quarter. Against this backdrop, screening for a potentially overlooked value stock with signs of a turnaround itself makes for a compelling thesis. 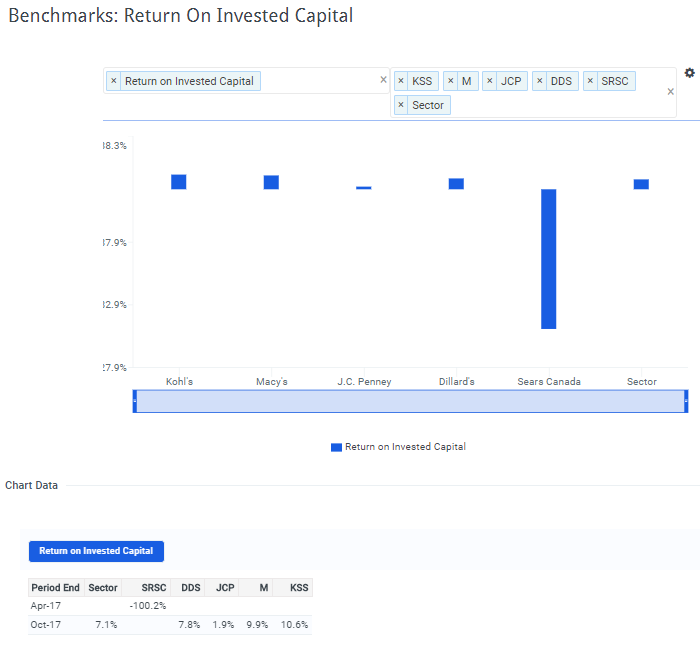 Department store operator Kohl’s Corporation (NYSE: KSS) seems to fit the bill. 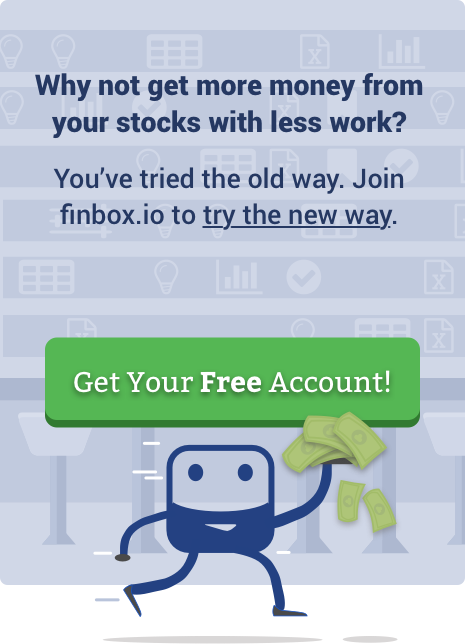 The company posted impressive numbers last quarter (more on those below) and finbox.io valuation models show nearly 30% upside. 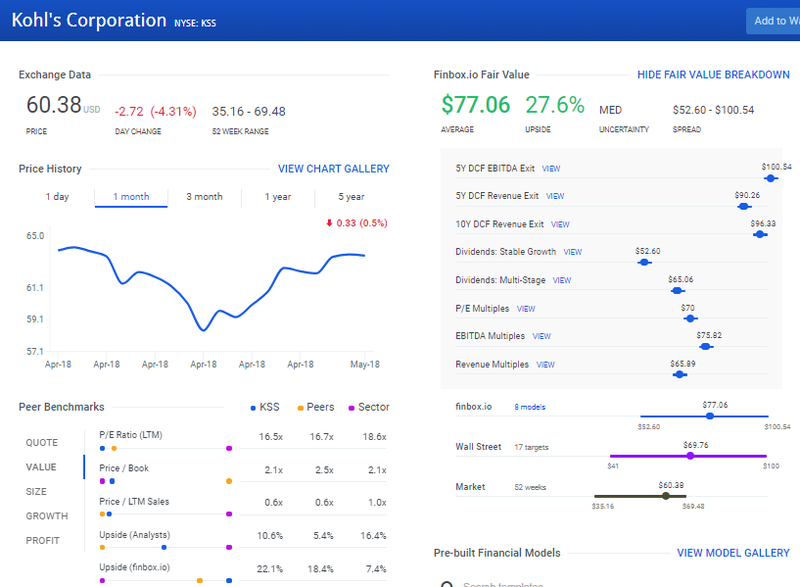 With Kohl’s set to announce earnings on the 22nd, let’s take a closer look at the company’s recent performance, competitive position, and strategic initiatives. Kohl’s offers a consistent assortment across its 1,158 department stores while also catering to local preferences. The Kohl’s website includes both exclusive and merchandise that is also available in stores. Kohl’s employed approximately 137,000 associates and receives nearly all of its merchandise through its nine distribution centers. Management has also shown a willingness to experiment with initiatives to increase all-important foot traffic. While many brick-and-mortar stores have been slow to adapt to Amazon and e-commerce, Kohl’s has decided not to go against the trend. While its Amazon pilot (accepting Amazon returns and selling Amazon smart home products) is still new, CEO Kevin Mansell said customer feedback “continues to be extremely positive” and they’ve have had initial discussions about pilot expansion. In addition, online demand grew 26% the fourth quarter (25% of overall sales). In March, management announced another pilot aimed to improve foot traffic in its partnership with discount grocer Aldi. In conjunction with right-sizing its footprint (for further inventory reductions and margin improvement), Kohl’s is experimenting with better-leveraging its retail space. A grocery offering would provide convenience and position Kohl’s as more of a one-stop shop. Other initiatives have included increased customization of assortments to local tastes and a commitment to removing more than $250 million from expenses. The popularity of off-price retailers like TJ Maxx (NYSE: TJX) and Ross Stores (NASDAQ: ROST) continues to be a competitive threat for Kohl’s. The ultra-competitive nature of retailing and difficulty in differentiating customer experience can pressure margins over the longer term. Cyclicality and exposure to consumer strength also presents risks to the sector as a whole. While growth investing has had its heyday, there are positive signs that bode well for a shift back to value. GDP growth and consumer spending also look poised for a rebound next quarter. Kohl’s offers its own turnaround story as management has shown a willingness to adapt its business to the e-commerce trend. Most notably, same-store sales showed very strong growth compared to peers last quarter. 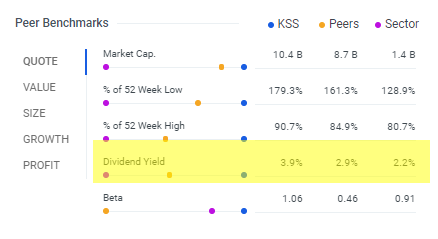 With almost 30% upside and a solid dividend, value investors should take a closer look at Kohl’s before it reports earnings later this month.